The new trailer for the upcoming third season of Orange is the New Black takes a look back at seasons one and two, and throws in a little bit of footage from season three. 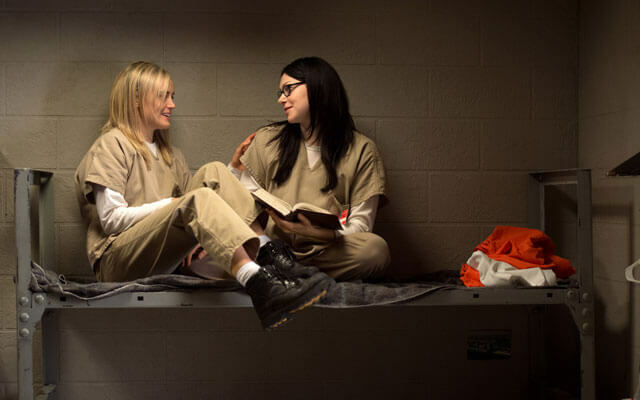 The third season of the critically acclaimed dramedy will be available for binge-watching beginning June 12, 2015 with Taylor Schilling back as Piper. Uzo Aduba, Kate Mulgrew, Dascha Polanco, Laura Prepon, Laverne Cox, Natasha Lyonne, Lea DeLaria, Danielle Brooks, Selenis Leyva, Yael Stone, Ruby Rose, and Taryn Manning co-star. In other news, Orange is the New Black has inspired its own ‘Con’. The #OrangeCon will take place for fans of the series on June 11, 2015 in New York. Details will be available via the show’s official Twitter account @OITNB.